Everything worth doing takes a little bit of work. And so it is with Som Tam. 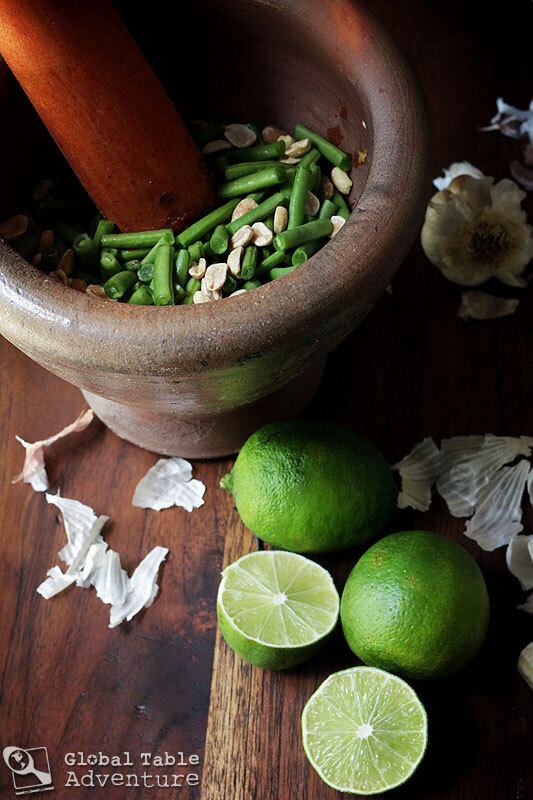 The mortar and pestle crushes the garlic, mashes a Thai bird chili peppers, and wooshes the fish sauce and lime juice into the green beans and papaya. I put the bowl on the table, dotted red with tomatoes. 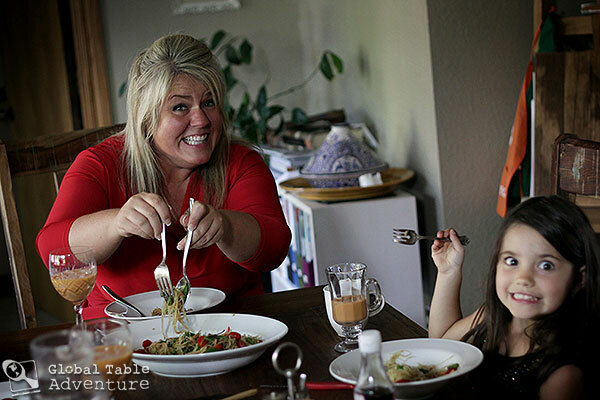 Ava thinks the papaya is spaghetti. The pale green shreds curl around her fork. “It’s something like that…” I say, hoping she believes me. She takes a bite, then another. Soon the forks on plates are the only noise. 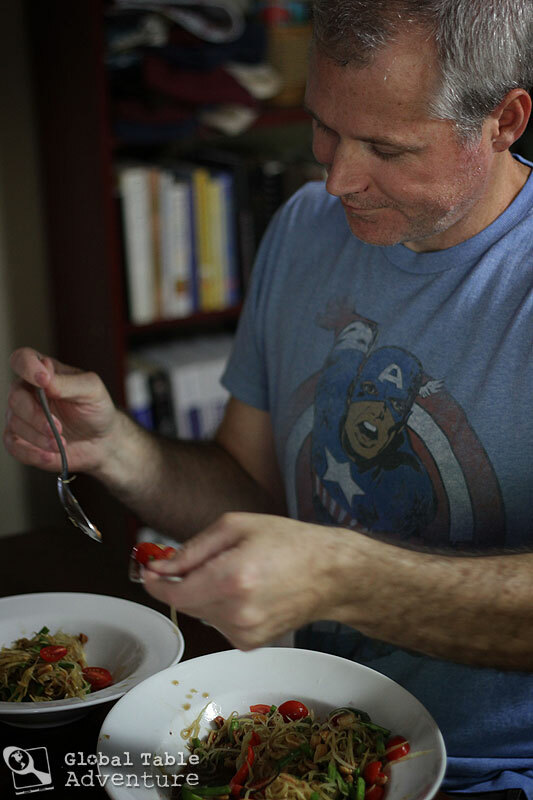 While I adore Thai food, I’d never had green papaya salad before this week. 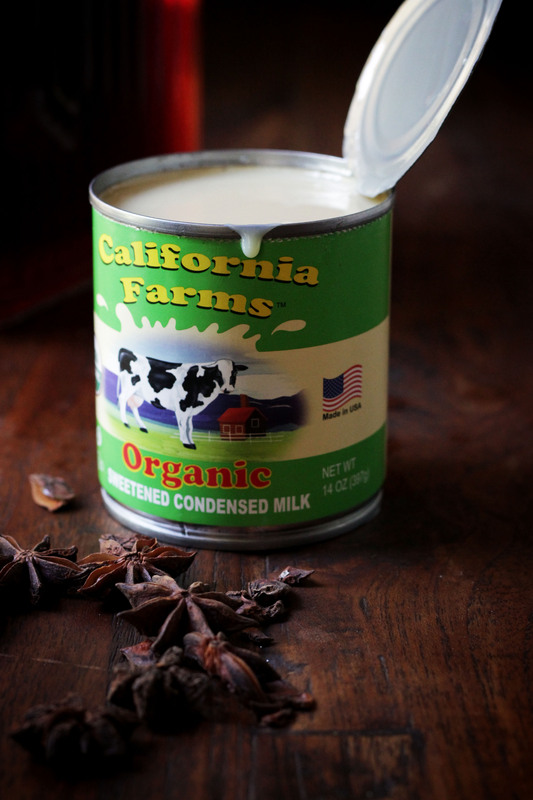 When several readers suggested I try it on our Facebook Page, I listened. First, I tried to order it at a local restaurant called My Thai Kitchen, just to see what all the fuss was about, but it wasn’t on the menu. So, instead, I went to our local Asian market, Nam Hai, and picked up what I needed, including some palm sugar, a green papaya (which they also sold pre-shredded – yay! ), fish sauce, Thai Bird Chili peppers, and some dried shrimp. There really wasn’t much to it! I was excited about all the ingredients, except for the dried shrimp, but when I opened my mind enough to chow down on one of them, I realized it was just a salty, chewy little bit of seafood. Good stuff! 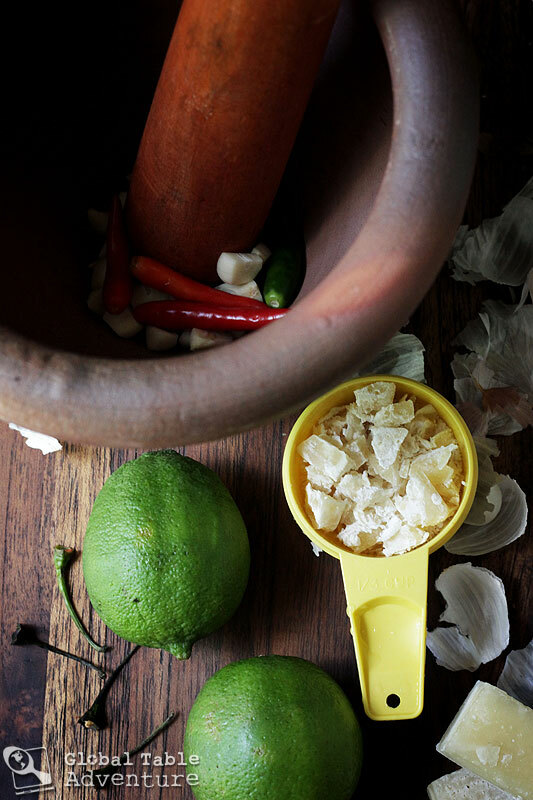 Some say you can’t have a real Green Papaya Salad without a good mortar and pestle. 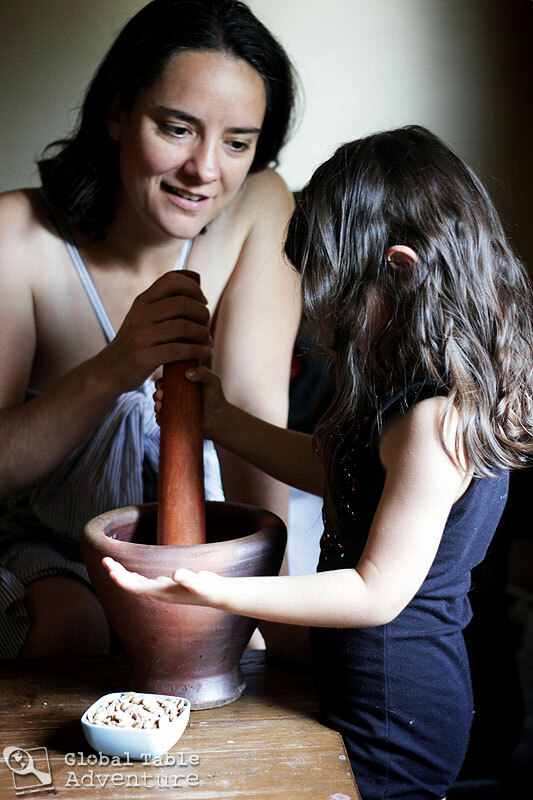 The traditional set up is a clay mortar with wooden pestle. I bought a set at Nam Hai for $15 (they had a huge selection of them – I purchased one of the smallest). Still, I love how deep it is and the pleasant (rather dull) sound (much different than my porcelain on porcelain set which makes a sharp, clinking sound). If you can find a set at your Asian market, I highly recommend getting one. First, let’s go to the market and get what we need. Taling Chan Floating Market in Taling Chan District, Bangkok, Thailand. Photo by Globe Trotter. 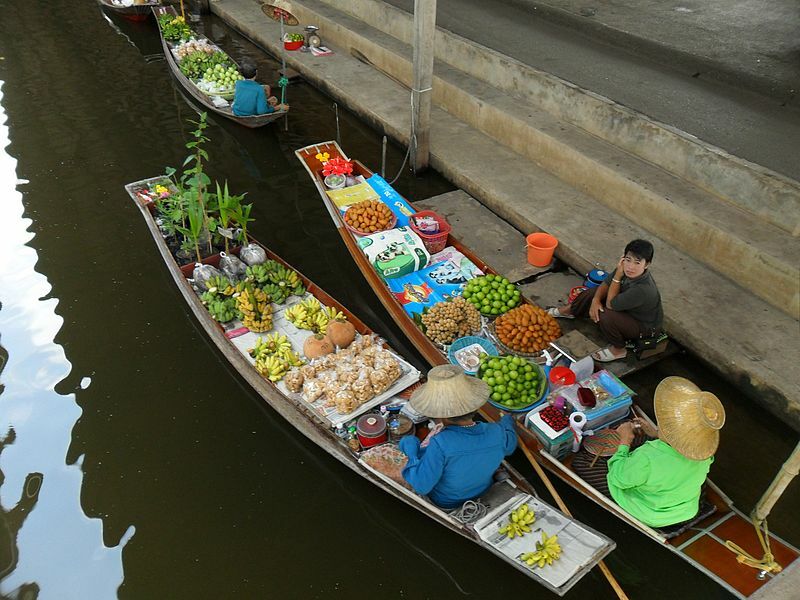 Boats at the Damnoen Saduak Floating Market, Thailand. Photo by Milei.vencel. Anyone else wish they could shop by boat? Ok. Next step. 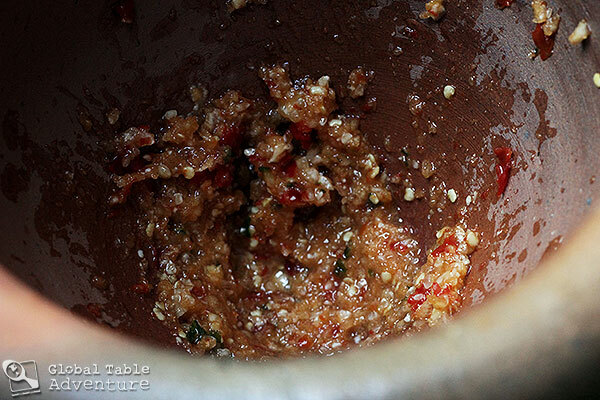 Pound the garlic with chilies and palm sugar until a paste forms. Next, give the peanuts several whacks until beginning to crumble, then add in the green beans. Whack them a few times for good measure. 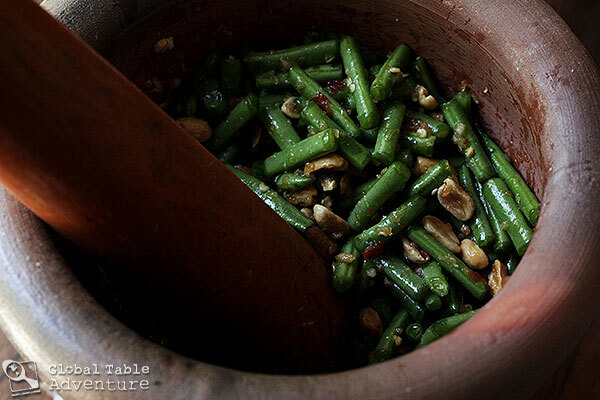 Stir in the tamarind paste, lime juice, and fish sauce until the green beans are evenly coated. The mixture will be wet and spicy… and all kinds of irresistible. 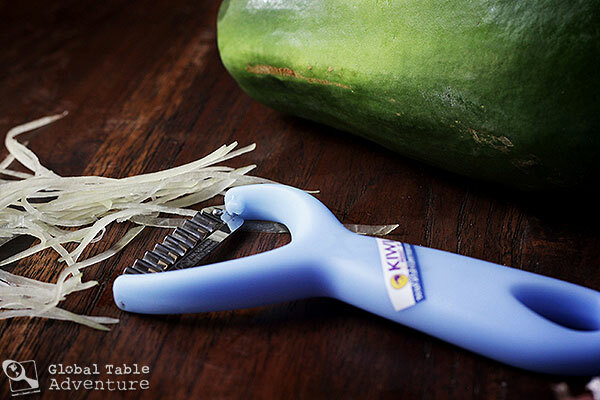 If you didn’t buy pre-shredded papaya, you can find a tool to shred it… it looks like a ridged vegetable peeler… which is exactly what it is. Simply peel the papaya and begin shredding. 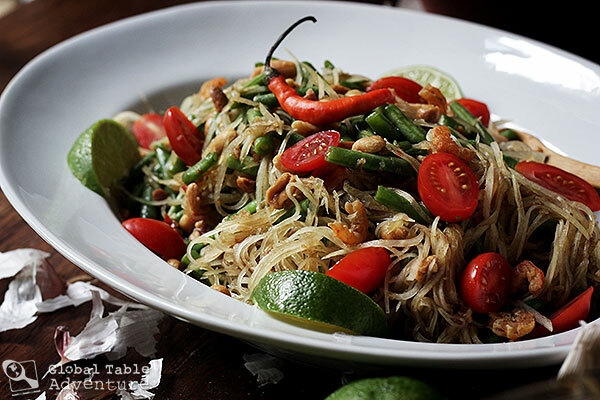 Finally, pile on the shredded green papaya, tomatoes and dried shrimp. Give them a few whacks with the pestle. If you end up like me, and you run out of room, transfer the mixture to a large bowl and mix thoroughly. Garnish with lime wedges, Thai Bird Chili peppers… even a sprinkling of cilantro, if desired. 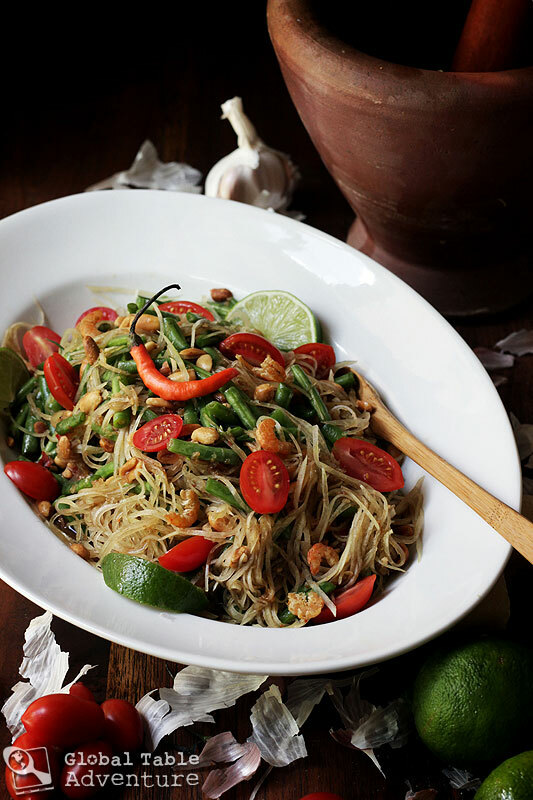 Have you ever eaten or made Thai Papaya Salad? How do you like it? Spicy or sweet? Do you have any tips for how to prepare it? Pound the garlic with chilies and palm sugar until a paste forms. Pile on the shredded green papaya, tomatoes, and shrimp. Give them a few whacks with the pestle. 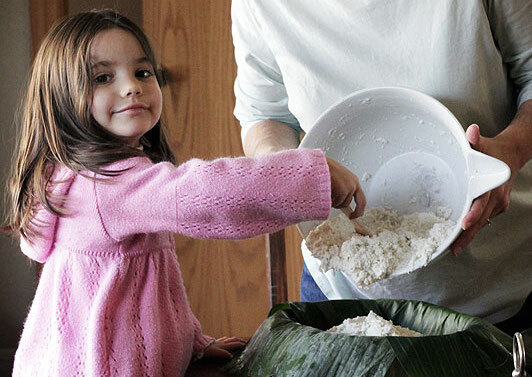 Transfer the mixture to a large bowl and mix thoroughly. 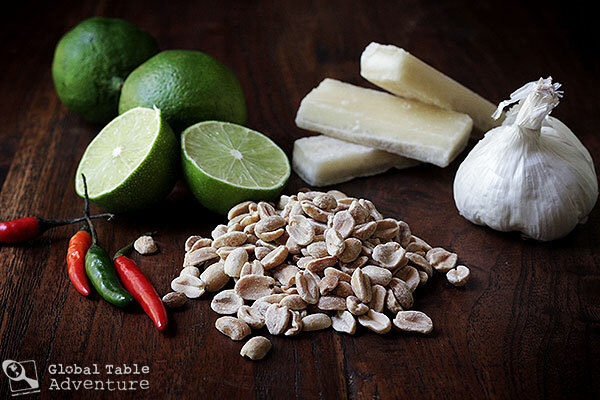 Garnish with lime wedges, Thai Bird Chili peppers… even a sprinkling of cilantro, if desired. For those at home, dont be afraid to mix it in another container if you have a smaller mortar and pestle. Thanks Ken! The floating markets have always fascinated me. Have you been to one yet? Ken, do you live in Thailand? Surely, you must since you mentioned the pick-up trucks! 🙂 I just moved back to the States after 4 years over there, and I miss having fresh produce drive right past my door every morning. They may not be pretty to look at, but they sure are convenient! Sasha, unfortunately, the floating markets are really maintained now more for tourism than actual trade, and tend to become incredibly (aka losing a bit of their beauty and tranquility) busy during open hours on weekends. This was the only Thai dish I tried in all my months in Thailand. I learned about Thai food later. It knocked my head off! Yes many versions of this dish use a LOT more hot pepper than you did. 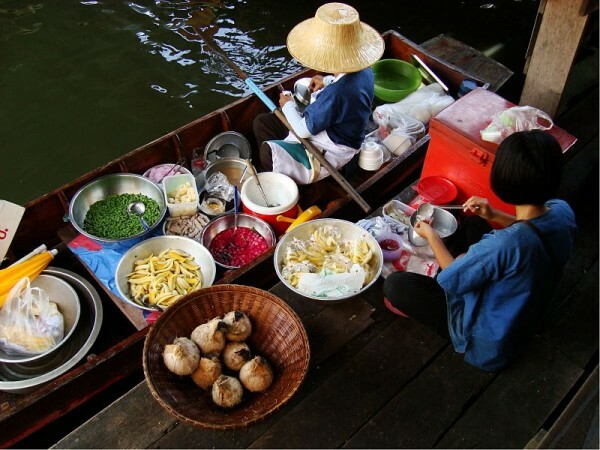 It’s one of the few Thai dishes which is authentically made to be very very hot. Of course you know this, but the ingredients maybe should specify green unripe papaya. Oh my version is certainly mild in Thailand haha! Great point on the ingredients; thank you. There is a great Thai restaurant in Portland Oregon called Pok Pok, named for the sound of the mortar and pestle. 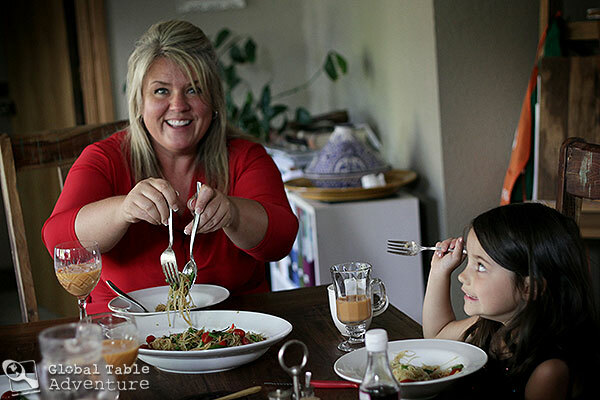 Where do you find green papaya, and how do you know they’re green!? Does it refer to a specific species, or just young papayas (like green bananas?). I’ve always wondered about this. 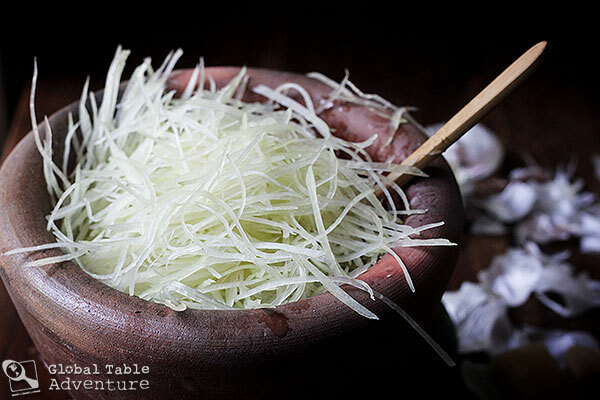 Shredded carrot is also widely used in this “regular” version of somtam as well (and if you ever cannot find the unripe green papaya in the States, using only long shredded carrot still makes a lovely salad with the flavors of this sauce). 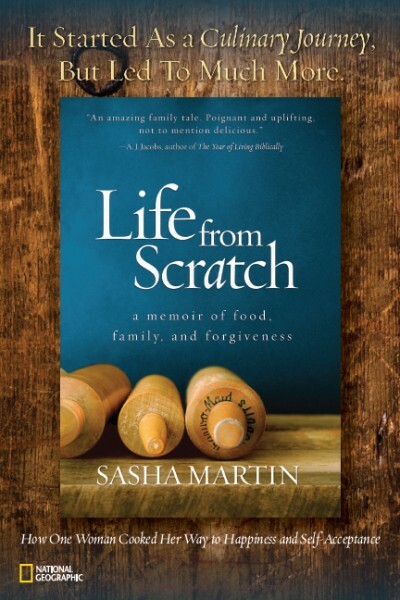 There are actually many versions including whole crabs (yes, pounding the shell to bits and all – not my favorite), large shrimp, and even fruit! Crazy as it may sound, there is an all fruit version of somtam that includes apples and pineapple as well, and it is delicious. 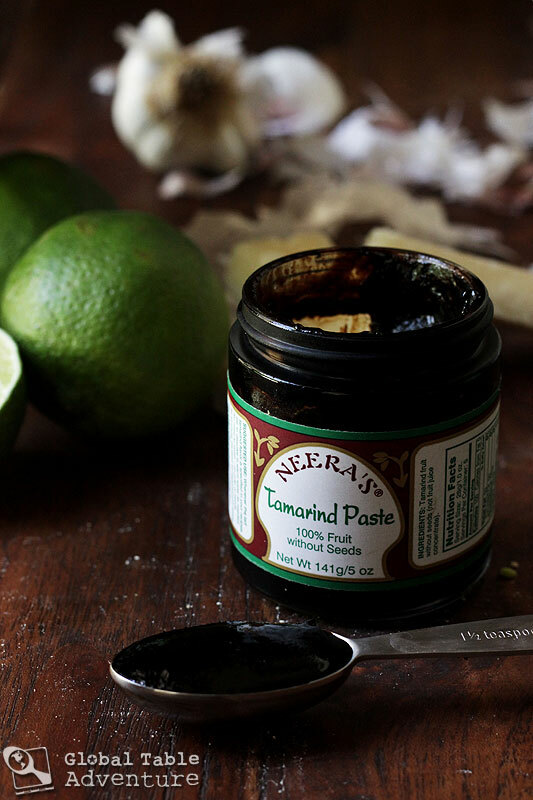 One ingredient I noticed above that I never saw added in somtam, though, is the tamarind paste. Perhaps that is a regional thing? I just may have to try it out, as I do love the punch that tamarind gives to Thai dishes. 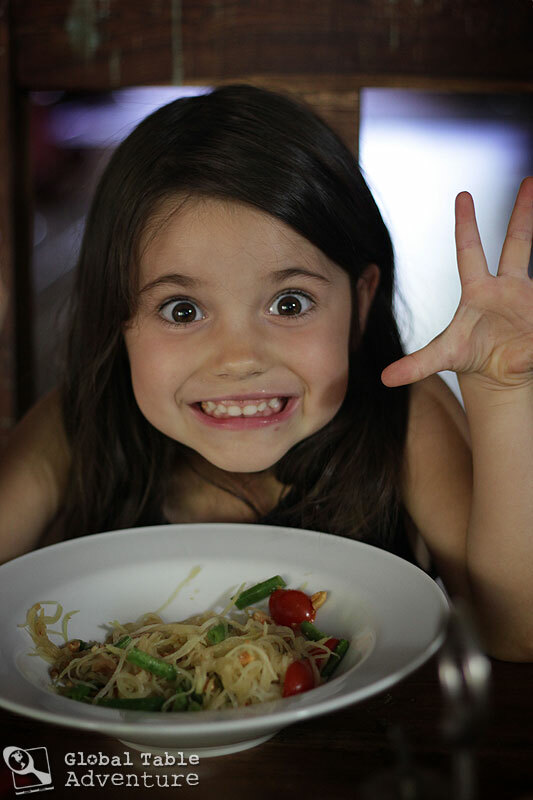 I LOVE green papaya salad! (Mostly I love the dressing.) I first saw it years ago on a menu as a seasonal special. Now it seems to be pretty standard on Thai menus, so I’m surprised your restaurant didn’t have it. We have lots of not-quite-ripe papayas show up at the grocery store here, but they’re not much good for anything. (Too ripe for this, not ripe enough to eat plain.) We’re pretty poor on international markets, but there is one small Asian market — perhaps they carry the papayas. Wow, I’d love to check that place out. Sounds like there’s lots of variety. 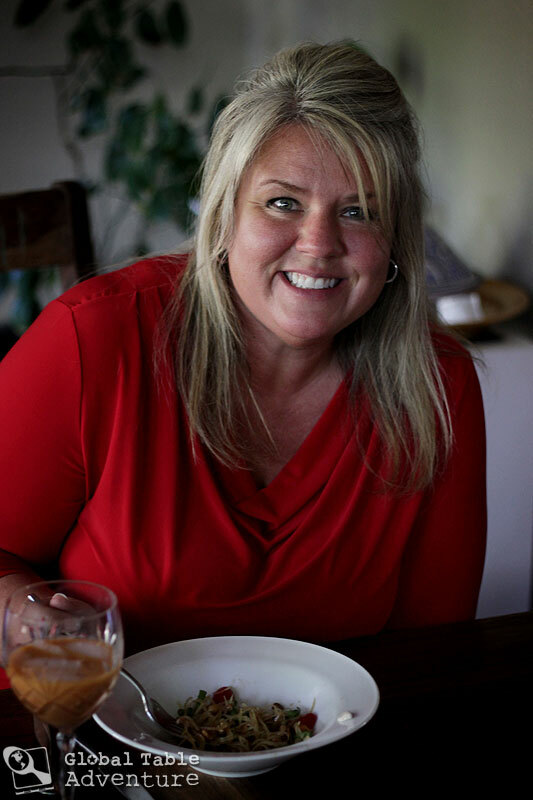 Hi Sasha, I loved eating som tam in Thailand with sticky rice and grilled chicken over charcoal. All three combined is a unique meal originated in Isaan, the northeast region of Thailand. 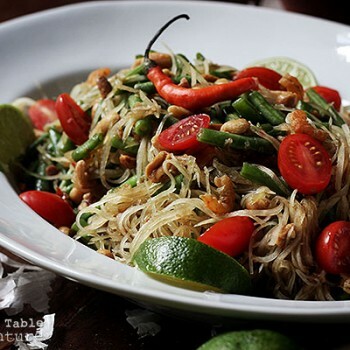 I miss Thai food a lot and I was excited to see you had a recipe for som tam (! 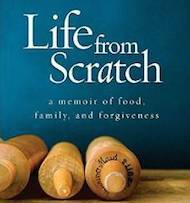 ), but realized I didn’t know where/when to put the dried shrimp. It looks like you added it as a garnish? Or was it pounded at some point?! Traditionally it would be pounded somewhat into the dish, but you can use it as a garnish if you’d like (that’s what I did).